Look no further, you have found the perfect place to organize your wedding or any other event. 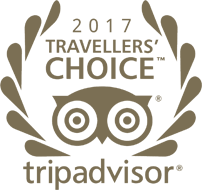 If you are looking to make this moment unforgettable for your guests, then your hotel Thalasso Hammamet will be the dream place. More efficient than a wedding planner, your Tunisia thalasso hotel takes care of everything, so let yourself go and make this moment an incomparable souvenir for all. At less than two hundred meters from a private beach and seen offering access to its many swimming pools but also its Thalasso center of 4500 m2 and its 37 treatment rooms, your wedding hotel in Hammamet has everything to satisfy cravings of each one. 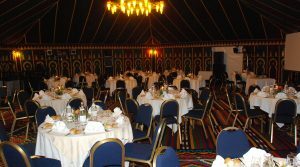 But because you are primarily interested in organizing this wedding or celebration, the Alhambra Thalasso Hammamet invites you to enjoy this refined and luxurious setting. The Andalusian architecture will be the setting for your celebration and each of your guests will reside in one of our 184 rooms, apartments and suite. The bridal suite for you to live a true fairy tale. Reception rooms, swimming pool, and seaside, everything is assembled to make your wedding a totally exotic moment. 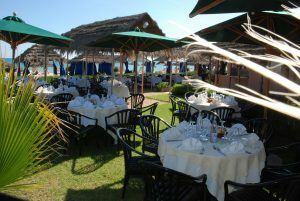 With no less than 8 restaurants and cafes, your Thalasso hotel in Tunisia leaves you to mark your preferences. 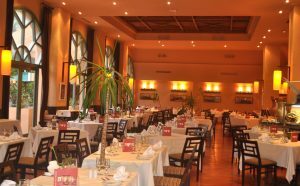 Mediterranean cuisine or French gastronomy, gourmet buffet or international cuisine, let yourself be guided and advised by our chefs who will make salivating young and old. More efficient than a wedding planner, your Thalasso hotel in Hammamet takes care of everything, leaving you the opportunity to enjoy these magical and unforgettable moments. So, ready to live this unique moment, contact us without delay and organize together this feast that will mark the spirits forever. A turnkey service, where we take care of everything to let you enjoy all our assets.